Posted on October 30, 2017 at 4:10 am. 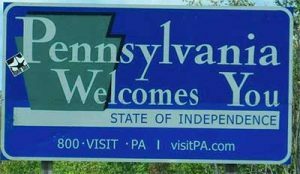 A bill legalising online poker and casino gambling has rapidly progressed through Pennsylvania’s two houses. The bill, which legalises online slots, table games and poker, passed the Senate and then the State House last week. The gambling expansion is now waiting to be signed into law by Governor Tom Wolf. Under the new legislation, Pennsylvanian casinos will be able to apply for a license to offer the aforementioned real money gambling games, provided they pay $USD 10 million for an online gambling license, plus 16 percent tax on poker and table game revenue and a whopping 54 percent tax on slots revenue. The bill has been in the works for quite some time, but it is only now being pushed through as a means to fill a gap in the state budget, which is likely why the tax rates are so high. Pennsylvania is currently experiencing a budget deficit projected to be as large as $2.2 billion, and lawmakers believe a gambling expansion in Pennsylvania will provide some solace. Floor leader for the Democrats, Senator Jay Costa, estimated that legalising online gambling could generate $200 million, while House Majority Leader, Dave Reed, said the state would be regulating activities which already take place. “It finally coming to fruition I think moves us closer to where reality is and is going to help out the taxpayers, as well,” Mr Reed said. The legislation also allows video gaming terminals at truck shops – a long-contested issue between the two state houses. “You literally could drive a truck through the definition and its ability to be misused,” he said. The bill, which made it further than another piece of legislation that favoured bars and other liquor licensees, instead of casino operators, also allows Daily Fantasy Sports (DFS) sites and online lottery sales to operate in Pennsylvania. Provided Governor Wolf signs the new bill into law, Pennsylvania will become the fourth state in the US to legalise online gambling, alongside Nevada, New Jersey, and Delaware. These three states recently announced an online shared poker liquidity deal, and if online poker is legalised in the state Pennsylvanians could eventually verse players in Nevada or NJ. In the meantime, players located in Pennsylvania could soon be able to play online poker with one another, granted the bill is signed into law. Non-residents will also be able to play online casino games and poker, provided they’re within state borders. And the bill is likely to be signed into law, with Governor Wolf expressing support for the gambling expansion in the past. His office said he would reveal whether he would sign the gambling legislation into law within the next few days. Looking for an online casino in the meantime? If you’re looking for an online casino to play real money games, players from United States should head to Slots.lv for the best online gambling software.